Christmas Raffle: The winner of the Christmas raffle was Yvonne Wright. The Society made $101 from the sale of raffle tickets. Once again "Thank you Carolyn" for your kind donation of the framed needlework and "Thank you" to all those members who supported the raffle. Other days and times at Springwood are possible but not guaranteed. Guest Speaker: There was no guest speaker for this meeting, instead members brought with them photographs of their school days to share along with anecdotes of their time at school. Rhonda Flowers prepared a "memory jog" sheet to record discusions and ideas and memories. As Rhonda is the editor of the Explorers' Tree, some of these will be used in forthcoming issues. Friday 26th - committee meeting. Our Guest Speaker was Susan Boyer who is a writer with a fascination for Australian history. She also teaches English to adults. 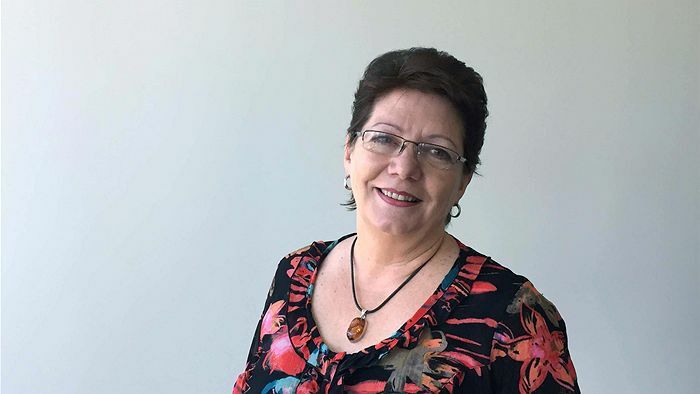 Susan's written the story of the initial years of contact between British settlers from the First Fleet, and the Aboriginal people living in and around Sydney Cove. At first the two peoples looked at each other in fear and mutual incomprehension, uncertain if they were dealing with people who were entirely human. Governor Phillip wanted to advertise the superiority of British culture. Meanwhile, Aboriginal people looked on the starving colonists with pity. Both sides worried the other lot might be cannibals. In CONVERSATION (ABC 702 Local Radio) with Richard Fidler, Susan Boyer weaves together little-known stories from the settlement of Sydney Cove. 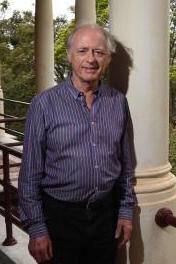 (Thursday 23 April 2015). You are able to listen to this wonderful discussion Susan has with Richard HERE. Our guest speaker for April was to be Margot Riley from the State Library but unfortunately Margot had had to postpone her visit until our May meeting. Ian Kendall filled in for the meeting. Do you have 19 convicts? Well Ian does and he introduced all 19 of them and then spoke briefly about a couple of them, his direct line paternal ancestor George Kendall, plus Matthew James Everingham (his maternal line) and William Shipman Baxter (maternal line) and then briefly, Thomas Radburn (Swing Rioter, paternal line). It was an extremely fascinating talk and many have spoken about it since. Our guest speaker at this May meeting wase Margot Riley, Curator at the NSW State Library. Margot has expertise in fashion, photography and popular culture. Her Topic: Identifying photographs; Photography and Fashions. 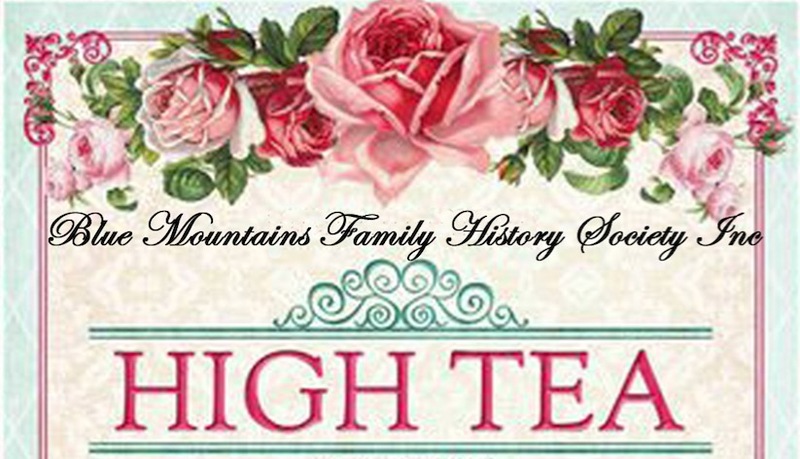 High Tea, as outlined by Yvonne at the February meeting, had been discussed and it was a very exciting event. The Hall had been booked for 14th May 2016. As an afternoon event would be preferable, the time of 2pm was decided. As well as providing a High Tea, part of the afternoon's entertainment was the reading of stories that participants in the day have written on the topic "Memories of a Special Woman in My Life". The story should be no more than one page and if there is an accompanying photo so much the better as it is planned to make up a booklet from the stories and sell at around $10.00 each. Should anyone not wish to read their story, Yvonne has offered to do this. As it was thought that the Hall could comfortably hold around 50-60 people $25.00 was thought to be a reasonable amount to charge considering the cost of catering and the hall hire to be paid to the Church. An attractive invitation had been prepared and had been sent out by email to our members and to local Societies. Bookings were essential. Members were not asked to contribute to the catering. Cakes were obtained from catering suppliers and members of the committee prepared the sandwiches. Special needs were also catered. Members were, however, asked if they could supply china cups, saucers and small plates and teapots if they have any sitting in their cupboards (gathering dust!). Due to illness the committee meeting was deferred until Friday 3rd June 2016 at which a quorum was achieved. Our guest speaker at this June meeting was Greg Clancy, who has written books on Indonesian history, the Asian economies, multiculturalism and people smuggling. In his new book, The People Trafficker, Greg has used features from all four books to create a fictional plot enhanced by the realism of how people smugglers and traffickers operate, and the successful methods they use against Western governments. Greg's interest in Asian history, culture and modern social development commenced in primary school and this has formed an underlying impact on his writing. He has resided in Sydney all his life and now, by a relocation coincidence, has returned to the area of his old primary school. Greg talked about his book, Hitler's Lost Spy. 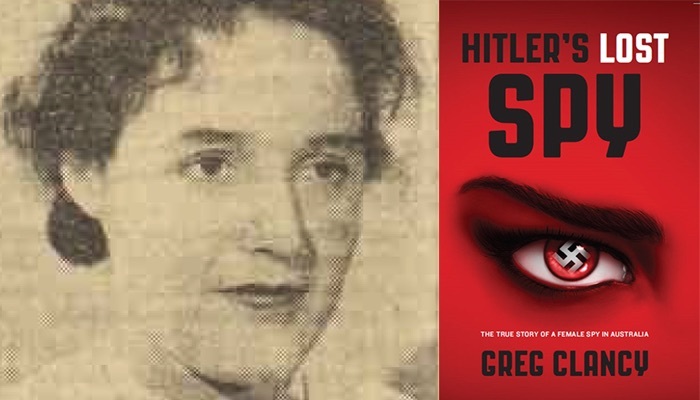 This is the remarkable story of the Swiss born Nazi spy, Annette Wagner. Her two years in Australia immersed in intrigue and shielded by a skilfully managed facade of deception. Tracked by Military Intelligence, her outstanding credentials in espionage ensured that exposing her ultimate role would never be easy. Less than 4 months after arriving in Australia in 1938, she acquired espionage's greatest communication asset - broadcasting her own programs on public radio to nationwide audiences - a secure channel for transmitting coded messages. This is a captivating narrative from within the global Nazi intelligence machine on the eve of World War ll. It includes the link with Japanese espionage in Australia during the late 1930s and presents new evidence in the continuing debate on The Battle for Australia. Overlooked in the National Archives for nearly seventy years, the story of the broadcasting spy may now be told. Please come to the meeting, listen to Greg's remarkable tale, meet the author and perhaps purchase a copy of his book. Steve Ford was the guest speaker at this meeting. Steve spoke about Land & Property Information where he is a researcher. He spoke at length (he was so interesting, time just disappeared) about about Land and Property Information available for Family History Researchers, available both on the Internet and in Sydney. He used numerous examples that were passed around showing the detail and types of documents that can be accessed. He used the Internet on-line and active and that was very instructive. Bob Howard Award: Vicky Edmunds from Blue Mountains City Library presented the Bob Howard Award to the lucky winner for a factual family history article in the Explorers’ Tree. The Winner of the Bob Howard Award for 2014 was Brian Meagher for his article in the October edition entitled "Richard Hardman of Hardman Brothers Biscuits". Coolgardie Safe Award: This award for the best article "keeping family history fresh" was won by our member Jo Adams in the March edition entitled: A Walk Through My 1940’s Childhood: Breakfast at Number 98. A special Mention was also made of the article in the March edition by Sue Forsyth: Susan Bel McGahey, matron and nurse reformer, 1862 - 1919. Any member contributing a story to the Magazine is a potential winner for either the Bob Howard Award or the Coolgardie Safe Award. The first edition for 2016 of Explorers' Tree was available for members at the March meeting. Those who have paid for their copy to be posted should have received them early in March. Copies for those who were unable to attend the March meeting and who do not pay for postage, will find their copy in the Concertina file in the Family History Centre of the Springwood Library. Being the 100th Edition of Explorers' Tree, the March 2016 journal includes a complimentary 100th Edition Extra, a reprint of Edition No. 1 of January 1987. The June issue of Explorers' Tree will be available at the July meeting due to the Editor having a well needed holiday in May and June. This year the dates are Friday 1st August until Sunday 31st August with BMFHS activities planned in Springwood. 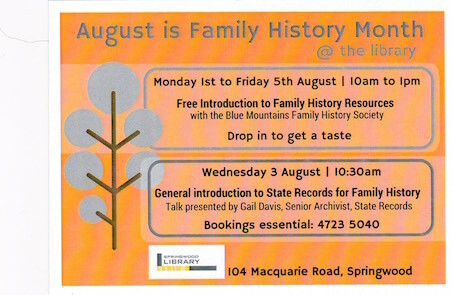 August is Family History Month and in the Blue Mountains this was celebrated during the first week with A Family History Celebration in Springwood Library. Members of our Society were present each day Monday to Friday in the Research Centre to provide family history information and give people "a taste". Library Staff provided tea and coffee and biscuits for all who came and by Thursday 1:00pm, some 32 persons had visited. A number of people took membership information and a small group learnt of the trials and successes of using the microfiche/microfilm reader. The feedback we received included "I didn't know you were here! "; "Can I get Ancestry? "; "Do you have information from ...". 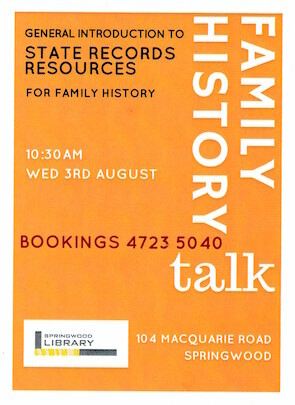 As well, the Library Staff organised a talk by Gail Davis, Senior Archivist, State Records on the Wednesday. 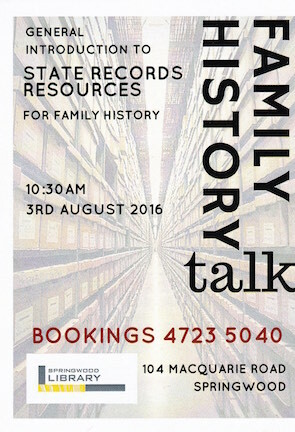 Her talk was titled, "General introduction to State Records for Family History", and was very well attended, indeed it was fully booked out by Monday morning. After the talk, many attendees visited the Centre. Many Thanks to the Library staff for their work and coordination. 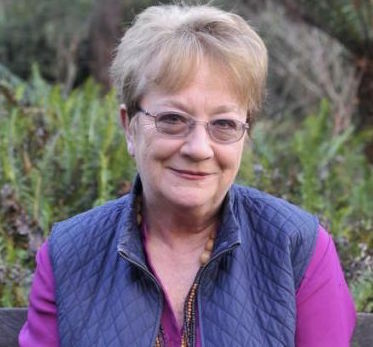 Our guest speaker for our August meeting will be Babette Smith, mediator, conciliator, dispute resolution consultant and the author of a number of historical books such as A Cargo of Women, Susannah Watson and the convicts of the Princess Royal, A Cargo of Women - the novel, Australia’s Birth Stain and in 2014 The Luck of the Irish. Babette will talk about her research and her writing and will have copies of her books for sale. 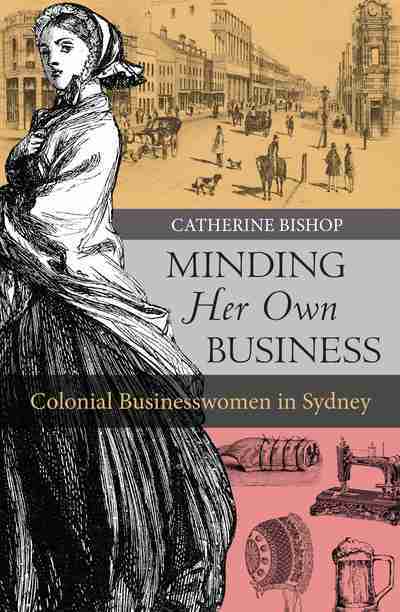 Our guest speaker for our September meetings will be Dr Catherine Bishop and will speak about the "Remarkable and Scandalous Businesswomen of Sydney's Past". 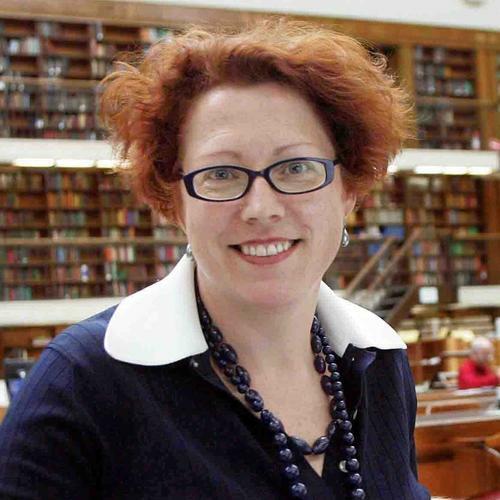 Catherine is an historian at the University of Sydney and the Australian Catholic University, and author of the book Minding Her Own Business: Colonial Business Women in Sydney (2015). Dr Bishop was featured in Issue #31 of Inside History magazine (available in the Family History Centre in Springwood Library) and an extended version of that article can be found on the Internet. Join Dr Catherine Bishop as she explores the entrepreneurial careers of lesser known Australian colonial businesswomen. A history that populates the streets of colonial Sydney with entrepreneurial businesswomen earning their living in a variety of small – and sometimes surprising – enterprises. There are few memorials to colonial businesswomen, but if you know where to look you can find many traces of their presence as you wander the streets of Sydney. From milliners and dressmakers to ironmongers and booksellers; from publicans and boarding-house keepers to butchers and taxidermists; from school teachers to ginger-beer manufacturers: these women have been hidden in the historical record but were visible to their contemporaries. Catherine Bishop brings the stories of these entrepreneurial women to life, with fascinating details of their successes and failures, their determination and wilfulness, their achievements, their tragedies and the occasional juicy scandal. Until now we have imagined colonial women indoors as wives, and mothers, domestic servants or prostitutes. This book sets them firmly out in the open. No Committee Meeting was held this month due to various members' ill health and/or absence on holiday. 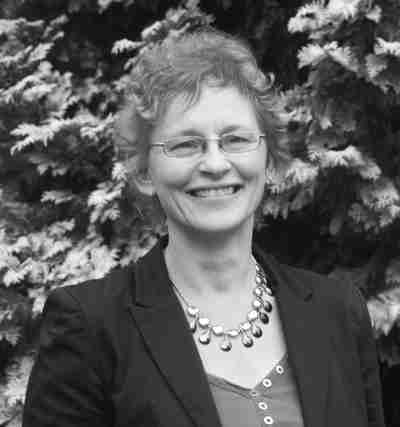 Our guest speaker for our October meeting was Vicki Wilson who spoke about letters from Gallipoli. Vicki researches documents for people who cannot get to State Records themselves. During this work she has come across the material for her talk, "Soldier's Stories from the Front". These are World War 1 stories, but with a difference. State Records NSW holds Probate Packets and preserved within these packets are a number of letters and postcards written by men who died on the shores of Gallipoli between April and December 1915. When taken as a whole, these letters tell a story from the perspective of men who were there: their day to day life; their hopes, and their fears. No matter the content, what these letters have in common is that the writers were all killed at Gallipoli. Vicki's stories and photos make us see them as the young men they were then. Just a few of the many young Australians who would never grow old. The November meeting of the Society will be held at 10:00am on Friday 11th November, 2015 in the Presbyterian Church Hall, Macquarie Road, Springwood. As this meeting is the AGM there will be no guest speaker however all members are encouraged to attend to hear the various reports from the executive of all activities of the Society. Please also consider standing for one of the positions and committee as it is our members who continue to make our Society strong and you can help. Committee: Up to Five (5) members plus those listed above. Any member who is willing and able to join the committee is encouraged to put their name forward for election. New members come with new ideas and these are always welcome. Being a committee member is not an onerous task. Committee meetings are held once a month, on the fourth Friday of each month. These meetings are held in the small room behind the Presbyterian Hall in Springwood. It is not essential that you attend each meeting, so long as there is a quorum the meeting can proceed - half the committee members plus 1. The vacant position, viz Vice President will be co-opted from nominations during the year under the rules allowed by our Constitution. Also at the AGM, a stalwart and hard worker of our Society, Mrs Margaret Chapman, was presented with a Certificate denoting her outstanding work as our "Morning Tea Expert". Margaret has graciously organized and provided morning tea at our General Meetings, and so we honour her for her ongoing support to the Society. A big thank you to all those helpers, in the kitchen. 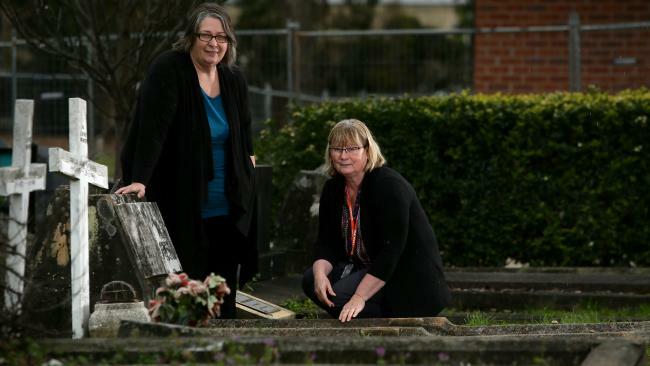 Convict Interests The Blue Mountains Family History Society has has been compiling a list of Convict Ancestors, Pioneers and Interests of our Members. Many of our members have quite a few Convict Ancestors whilst others are researching groups of Convicts or particular Convict Ships. This list, along with details of the member involved is available at the Family History Centre in Springwood Library in a loose-leaf folder.